The Life History of The Canadian Salmon: Salmo Salar. Norwood, Massachusetts: The Plimpton Press, 1929. 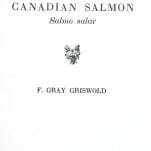 First privately printed edition of Frank Gray Griswold’s tribute to the Canadian salmon. Octavo, original wrappers as issued, full color illustration of the “Griswold Gray” lure affixed to front panel. 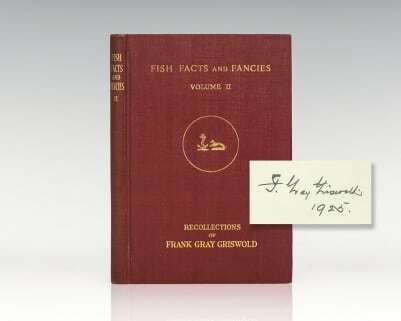 Singed by the author on the half-title page, “Frank Gray Griswold.” In very good condition. American author and sportsman Frank Gray Griswold authored dozens of books with a particular focus on salmon fishing, many printed privately and distributed among his personal friends. In Salmo Salar, Griswold takes an academic approach to the study of the declining salmon population throughout the rivers of North America. 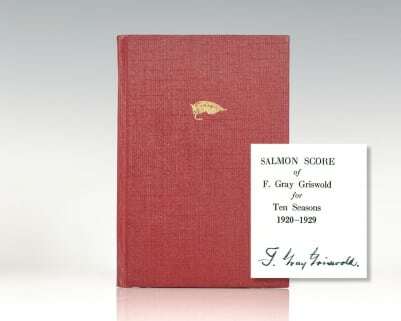 Salmon Score of F. Gray Griswold for Ten Seasons 1920-1929. Canada: Grand Cascapedia River, 1930. 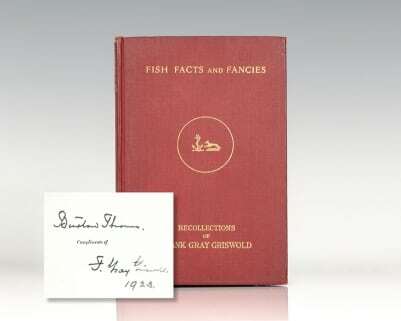 First edition, presentation binding of Griswold’s catch records between the years of 1920 and 1929. Octavo, original cloth gilt. 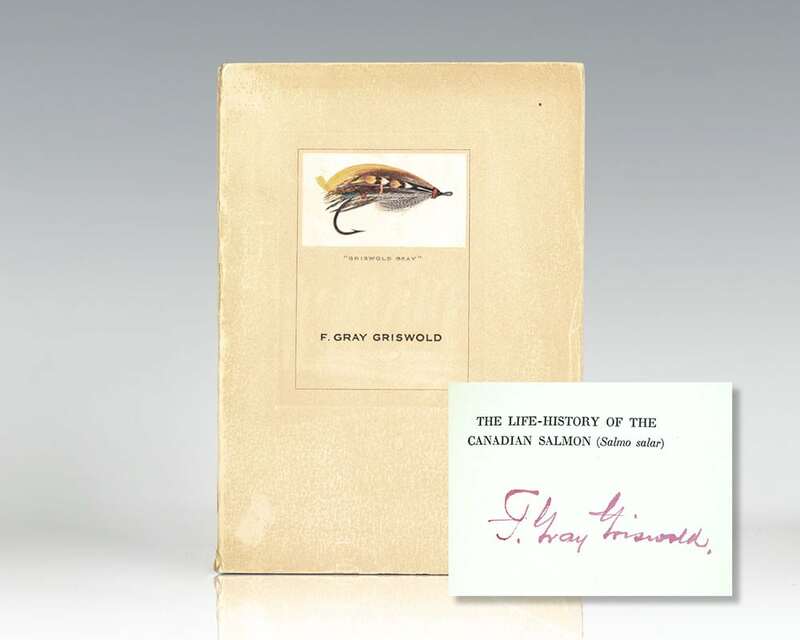 Signed by F. Gray Griswold on the title page. In near fine condition. Norwood, Massacusetts: Plimpton Press, 1927. 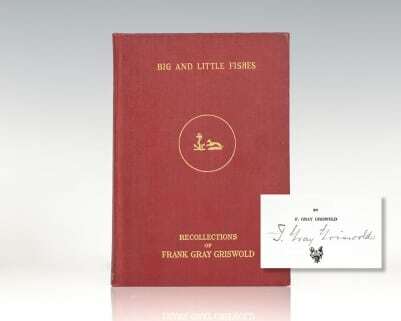 First edition of Griswold’s recollections fishing salmon pools. Octavo, original cloth gilt. Signed by Frank Griswold on the title page. Full color actual size frontispiece of the bucktail dry fly lure used to catch a 32 pound salmon. In near fine condition. The Memoirs of a Salmon. Norwood: The Plimpton Press, 1931. 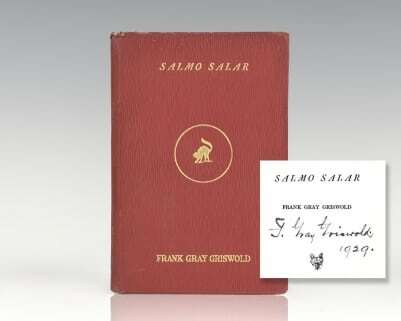 First edition of Griswold’s novella depicting the experience of a salmon from life to death. Octavo, original boards engraved frontispiece. 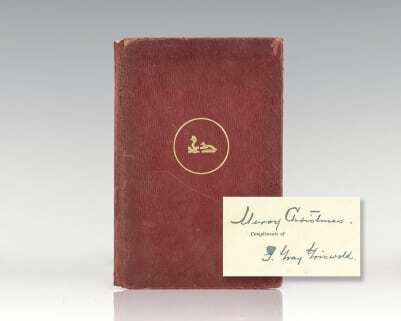 Inscribed by the author on the half-title page, “Merry Christmas, F. Gray Griswold.” In very good condition with some rubbing and wear to the extremities. 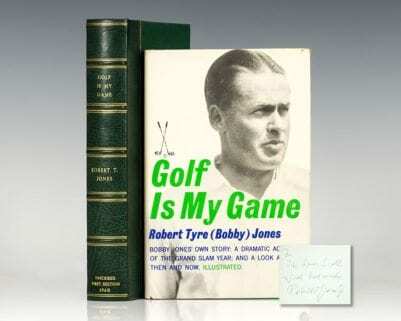 First editions are uncommon, especially signed. Norwoood: The Plimpton Press, 1925 . First edition of Griswold’s manual covering both freshwater and saltwater sport fishing. Octavo, original cloth. Volume II. Gilt titles and tooling to the spine and front panel. 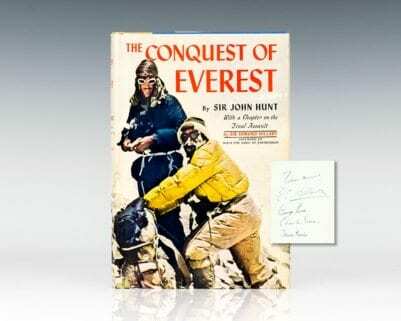 Signed by the author in the year of publication on the half-title page, “F. Gray Griswold 1925.” In near fine condition. An exceptional example. Norwood: The Plimpton Press, 1920. First edition of Griswold’s guide to fishing the Great Cascapedia. Octavo, original cloth. 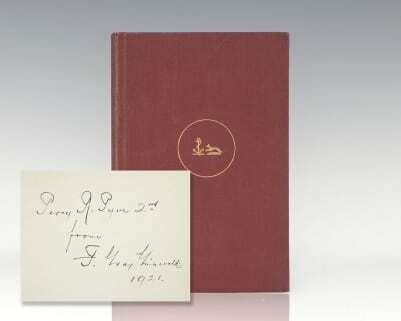 Inscribed by the author on the front free endpaper, “Percy R. Pyne 2nd from G. Gray Griswold 1921.” In near fine condition. A nice example. Norwoood: The Plimpton Press, 1923. First edition of Griswold’s manual covering both freshwater and saltwater sport fishing. Octavo, original cloth. Gilt titles and tooling to the spine and front panel, top edge gilt. Inscribed by the author in the year of publication on the half-title page, “F. Gray Griswold 1923.” In near fine condition. A nice example. Observations on a Salmon River: Recollections of Frank Gray Griswold. New York: Thomas Gibbons, 1922. 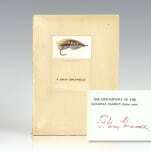 First edition of Griswold’s recollections of salmon fishing on the Grand Cascapedia River in the Recollections of Frank Gray Griswold series. Octavo, original cloth, gilt titles to the spine and front panel. Inscribed by the author on the front free endpaper, ” Compliments of F. Gray Griswold 1923.” Frontispiece map of the Grand Cascapedia River, illustrated with photographs. In near fine condition. A very clean example. 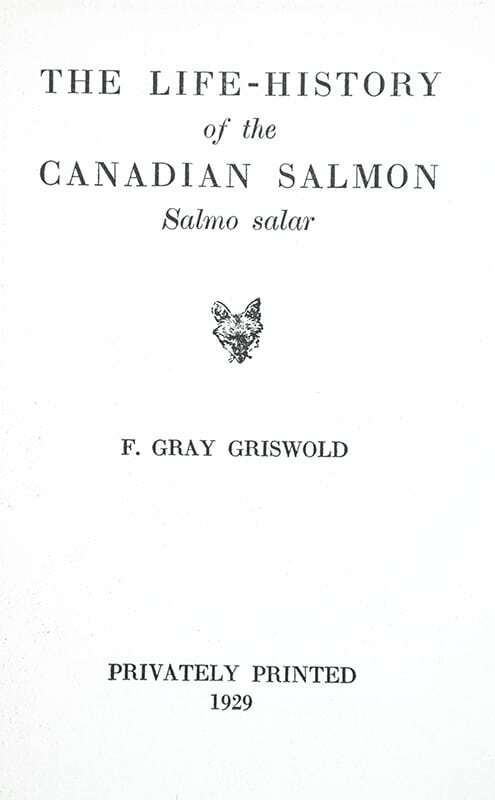 First edition of Frank Gray Griswold’s tribute to the Canadian salmon. Octavo, original cloth, gilt titles to the front panel. Signed by the author in the year of publication on the title page, “Frank Gray Griswold 1929.” In very good condition. Some Fish and Some Fishing. New York: John Lane Company, 1921. 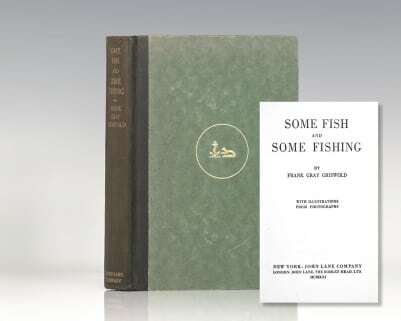 First edition of Griswold’s book on sea fishing. Octavo, original cloth over olive green boards, gilt titles and tooling to the spine, illustrated throughout with photographs and maps. In very good condition. A nice example.